I found this shirt at a clothing exchange and loved its day-glow colors. It’s definitely not for the faint of heart, but I took it figuring I could pair it with black pants. 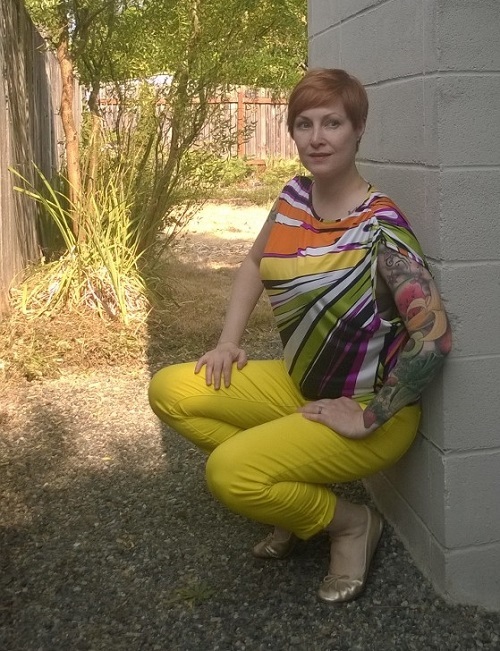 However, when I saw that the yellow in the topic was the same hue as my highlighter-yellow cropped jeans I decided to put the two pieces together. Gold shoes aren’t exactly subtle either but I went with these because a demure ballet flat seemed to be a good fit for the psychedelic swirls in the shirt. It’s not often I find a shirt busier than my tattoo sleeve! 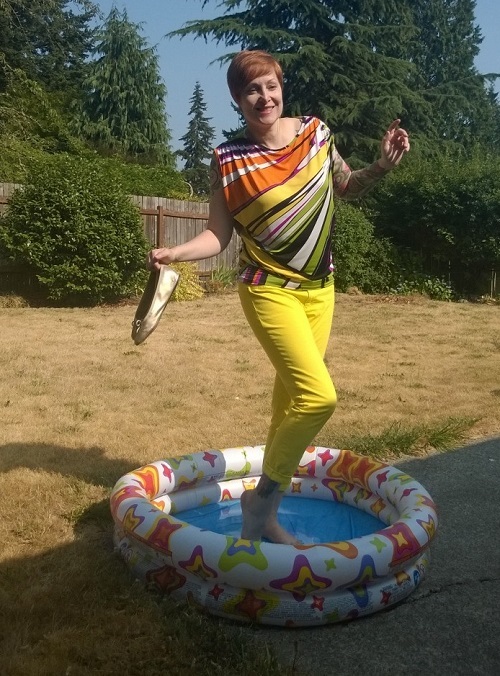 It’s summer, and to me that means bright, fun clothes—especially ones that you can get wet! I bought a little pool for my dog so he can cool off. I enjoy dipping my toes in the water too. What are your go-to summer tones? I’ve joined Happiness at Midlife, High Latitude Style, The Penniless Socialite, and Rachel the Hat for blog linkups. See what everyone else is wearing! I love yellow!!! this summer I have been obsessed with it.. also been obsessed with good ol white! I LOVE how you found a great top at a shirt exchange that may or may not be too much for some people’s personal style and you turn it into an AMAZING look. Everything pieces together perfect. You have a lucky puppy too, how many dogs have their own pool. Thanks for linking up to Top of the World style. Your outfit is so sunny summery. I love it! 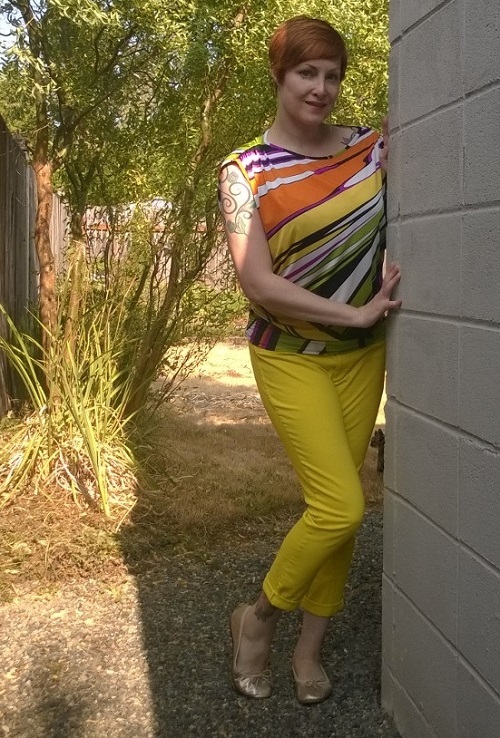 This is a great summer look – I love this fun stripe top! 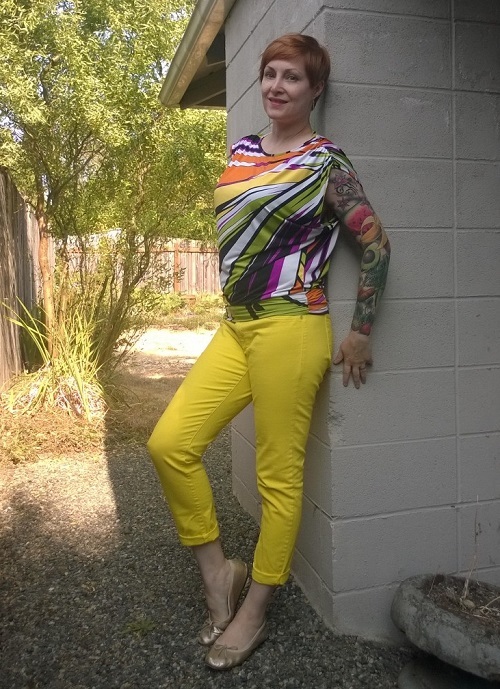 Hi Jean, I really love how to match your pants and shirt with those flats, yellow sometimes is a color hard to match but you did wonderful and gave me ideas how to adapt this color to my summer outfit ! !